When it comes to your German-made vehicle, repairs are inevitable. We don’t say this to imply that German automobiles are prone to break, we simply say this because eventually all vehicles have to be repaired. Automobiles, like any machine, degrade over time and occasionally need our help to remain functional. At Avalon Motorsports in Denver, we want to be your number one choice when it comes to German auto repair. Our expert mechanics and knowledgeable staff have years of experience dealing with German auto repair issues and feel that we are your best choice when it comes to ensuring that your vehicle is in good repair. In today’s post, we are going to list some of the most common repairs associated with German vehicles and what you should be on the lookout for to prevent any permanent damage from occurring. While the Germans did not reinvent the automobile, they did bring a level of engineering to them that can cause certain issues to crop up in repair shops around the world. 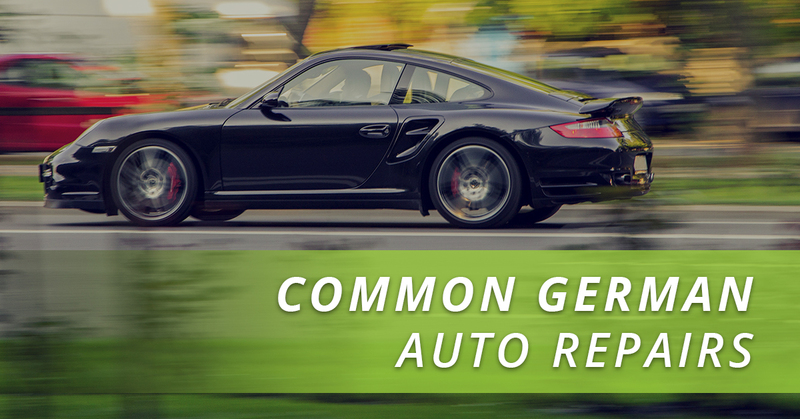 Luckily, specialized German auto repair shops, such as Avalon Motorsports, are available to quickly assess any issues with a vehicle and determine the best course of action in fixing the problem. While some issues are more important than others, any issue that requires repair should be taken seriously. Below, we have listed some of the most common repair issues that German vehicle owners experience. The BMW Crankcase Ventilation System: For the past century, BMW has been synonymous with luxury. These German automakers have carved a prominent spot for themselves in the world of luxury vehicles and, deservedly, have become one of the largest luxury vehicle manufacturers on the planet. However, even BMWs need repairs. One of the most common repairs faced by BMW owners deals with the crankcase ventilation system. This system uses a spring and diaphragm assembly to control the pressure of the vehicle’s crankcase and maintain a slight vacuum. The vacuum helps to ensure that the crankcase in properly venting, however, occasionally things can come out of sync. If you notice your BMW is running roughly or you hear a slight whistling noise it is imperative that you bring it into a German auto repair shop. Mercedes Fluid Leaks: Another German automaker, Mercedes, is world renowned for their ability to produce luxury vehicles that are sleek, stylish, and functional. And, like any other vehicle, they occasionally have some problems. For Mercedes, one of the most common repair issues has to deal with fluid leakage. As you are probably aware, vehicles should not leak fluid and if you notice that your Mercedes is leaving behind a puddle whenever you park it, we highly suggest that you bring it into our German auto repair shop. Most commonly, Mercedes leak transmission fluid caused by a faulty transmission plug. Over time, the seals around the plug begin to degrade, causing the transmission casing to slowly leak fluid. If left unattended, this small leak could have a serious impact on the transmission of your Mercedes. Audi Electrical Issues: Audi, a member of the Volkswagen Group, is known for providing a wide range of luxury vehicles including sedans, SUVs, and sports cars. Audis are also known, unfortunately, for having electrical issues. Considering the amount of electrical components that Audi engineers are able to shove into their vehicles this issue should come as no surprise but, nonetheless, it can be rather annoying for the owner. Most commonly, the instrument cluster (the area containing the speedometer, fuel gauge, vehicle temperature, etc.) will either have a partial or complete failure. This failure can be caused by a multitude of things but is usually a result of a corroded wire or faulty electrical connection. Whatever the cause, it is important to bring your Audi into a German auto repair shop to have it looked at. Not only will the mechanics have more experience with Audi, they will be better able to order any repair parts that your vehicle may require. If you are in need of a German auto repair shop, please contact us today at Avalon Motorsports. We have the knowledge, tools, and experience necessary to repair any issue that may be affecting your German automobile.